I wanted to take the family camping but if you know me camping usually involves hours of driving on some unmaintained forest service dirt road. I wanted to keep this trip close to home but I’m not one for the KOA or campsites with the nice background noise of a highway. So where to go that’s out in nature with few people, yet not a total back road excursion? Answer, Trout Creek Campground. Why? Trout Creek is easy to get to. It is paved most the way turning to a well maintained dirt road for the last 2 miles. I find that dirt roads detour a lot of people. Most importantly there is a pristine river 200’ from the campground. For my kids, family camping must include some sort of water feature. Named for the tributary creek that runs along the east side of the campground Trout Creek is located on the Eel River near Potter Valley. 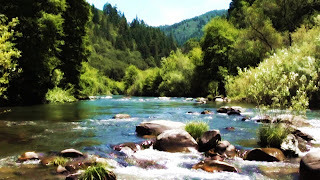 Trout Creek is just outside the Mendocino National Forest along Eel River Road (County Road 240). Lake Pillsbury is just 9 miles down the road but that’s another post. 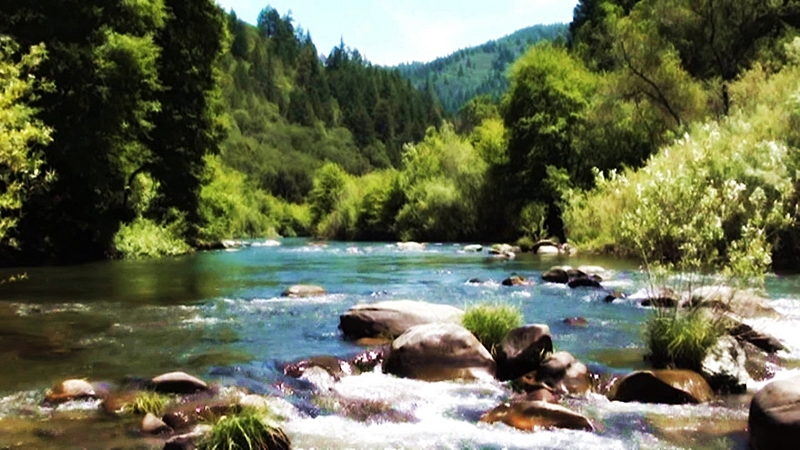 Trout Creek Campground is operated by PG&E as part of the Potter Valley Hydroelectric Project. (Now there is some controversy surrounding the hydroelectric project but let’s just talk about enjoying what is here) It is what you would expect from a maintained campground. There are 17 camp sites 1 group site 3 walk in sites, a camp host, water, fire rings, picnic tables, vault toilets, dumpsters and pets are allowed. Additionally RV's are allowed, there is nothing posted but looks like you could bring a up to about a 24' trailer. This is a fee area, and is closed in winter (I don’t have dates). Also be sure to visit the Firefighter Memorial just outside the entrance to the camp. The campground is under a canopy of redwood, oak, pine and madrone. The sounds of birds chirping and running water can be heard thorough the campground. The river is close but not too close for those of you with young children, even at the closest site the water is still about 200’ away. A path leads down to the river bank and forks right or left. Both paths lead to nice swimming holes outside of the current of the river. Some people use this area as a put-in and float or kayak down to the bridge you crossed to get here. I truly enjoyed my visit but here are a few cautionary words. Rattlesnake country - they’re out there, poison oak - if you get it, swift current - especially during spring snow melt but always beware. That being said, have fun, be safe and come back and share your experience. Wow! I've kayaked the Eel River Pillsbury Run right past the campground quite a few times, but never noticed that there is a campground there. Next time I go there I'll definitely plan to camp out overnight and enjoy the place a little more.